By grrlscientist on September 27, 2007. 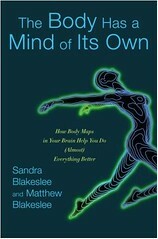 As a biologist who reads both widely and deeply about a number of scientific topics, it is very rare when I read a popular book that adds depth and nuance to my understanding of a biological phenomenon, but The Body Has a Mind of Its Own By Sandra Blakeslee and Matthew Blakeslee (NYC: Random House; 2007) is that book. This quiet but well-written book explores the interconnection between the environment, the body and the brain; discusses that the body is more just than a container for the brain and a vehicle that moves it around; and reveals how the brain depends upon sensory feedback from the environment in order to develop properly. Basically, the body and the mind interact constantly using a flexible network of body maps that exist in your brain, enabling you to interact with your environment. But unlike standard road maps, body maps are dynamic; growing, shrinking and changing based on a variety of neural inputs to meet your needs. What initially captured my attention was the story of how, if you carry a young kitten around during its early months of life when its brain is rapidly developing, allowing it to see everything around it, but never allowing it to experience the world by moving around on its own, that kitten will end up functionally blind for life. Sure, the kitten would be able to perceive light, shadow and color, but it would be incapable of recognizing objects and it would lack depth perception. Why? Animals (and people) develop body maps by interacting with the world so the developing visual system receives the necessary feedback to properly decode the the flood of colors, shapes and shadows that stream into the brain. Without that critical experience, the brain cannot construct the proper context for this information. After telling the story of the kitten, the authors go on to explore the human brain map that processes incoming touch signals and the motor map that sends signals to your muscles. As the diagrams clearly show, very large areas of these brain maps are devoted to inputs from our fingers, lips and tongue when compared to the maps that correspond to the rest of our bodies, because accurate input from these areas is so important. They also compare the human brain maps to those for a few other animals, such as racoons. These brain maps are dynamic; they are capable of being restructured based on new information. As a result, for example, pianists have an enlarged brain map for each of their fingers when compared to people who have never played the piano. The authors then go on to discuss examples of errant body maps and their effects, such as why people still feel fat after losing weight, how professional golfers suddenly lose their ability to play golf (a dreaded condition known as the "yips"), why amputees still feel their former limbs (the so-called "phantom limbs" problem) and why other people believe they have extra limbs (supernumerary limbs), how people have an out-of-body experience and why a healing touch works, how video games -- particularly wii -- can produce an illusion that is completely convincing, and why yawns are so "contageous". The authors also describe how one relies on body maps and can use them to their advantage, for example; how athletes, dancers and musicians have improved their performances through mental practice without flexing a muscle, and how people become "bilingual" by accurately reading the body language of their pets. I thought the chapter that discussed mirror neurons was especially well-written. Mirror neurons are a recent discovery. These are the neurons that will fire in your brain when you observe someone else pick up their keys or lift a cup to their mouth, allowing you to predict other people's intentions and motivations. These are the neurons that allow you to learn to do something new just by watching someone else do it. Mirror neurons are also the source of empathy because they react to other people's emotions. For example, when someone is sad or happy or angry, your mirror neurons give you the same feelings. When someone experiences pain, you feel the same pain because your mirror neurons respond in kind. Interestingly, autism might be caused by a lack of mirror neurons, since autistic people cannot recognize intentions or emotions in other people. This hardcover book is 228 pages long and is divided into ten chapters with titles such as The Body Mandala, The Little Man in the Brain, Plasticity Gone Awry, and Sticks and Stones and Cyberbones. It also includes pictures, drawings and diagrams that help to convey the concepts discussed in the book. Interestingly, it also includes special "boxes" that focus on interesting biological phenomena, such as explaining why you cannot tickle yourself. Sandra Blakeslee is a science writer and long-time contributor to The New York Times. While she specializes in brain sciences, her articles cover a wide range of topics, from Antarctic ice fields to Tasmanian Devils. She is co-author of numerous books, including Second Chances and The Unexpected Legacy of Divorce with Judith Wallerstein, Phantoms in the Brain with V. S. Ramachandran, and On Intelligence with Jeff Hawkins. She lives in Santa Fe, New Mexico. Matthew Blakeslee is a freelance science writer based in Los Angeles. This is his first credited book. He is the fourth generation of Blakeslee science writers. His great-grandfather, Howard Blakeslee of the Associated Press, was a founder of American science writing. Howard's son, Alton, (Sandra's father), was a science editor of the Associated Press. Born and raised in a science writing tradition, Sandra and Matthew have formed what may be the world's first mother-son neuroscience writing team. My review of "The Body Has a Mind of Its Own"
This sounds very interesting... does the book discuss autistic-spectrum conditions at all?